There are those who know right from the start what their path in life is meant to be. And there are those, like me, who have tried a number of different paths, some successful until they weren’t, some interrupted by crisis or tragedy or failure. I personally got to the point where I stopped thinking about the future, because I couldn’t bear the crushing disappointment. So when I answered the call to ministry, I was very clear that I couldn’t think all the way to ordination, because I couldn’t bear it if I didn’t make it. Instead, I would just do what was in front of me – apply to seminary, get funding, get through the semester, fill out the forms, write the essays, check off the boxes, etcetera, etcetera, etcetera. When I arrived in Southold in August 2015 following seminary and my internship, there were still steps ahead, and I still kept my head down, focusing on just the next step – prepare for the ministerial fellowship committee, complete my clinical pastoral education, fill out the forms, have the conversations, etcetera, etcetera, etcetera. And now, having been welcomed into preliminary fellowship (with more forms and essays, because I think paperwork will actually be the death of me), there is just one final step. 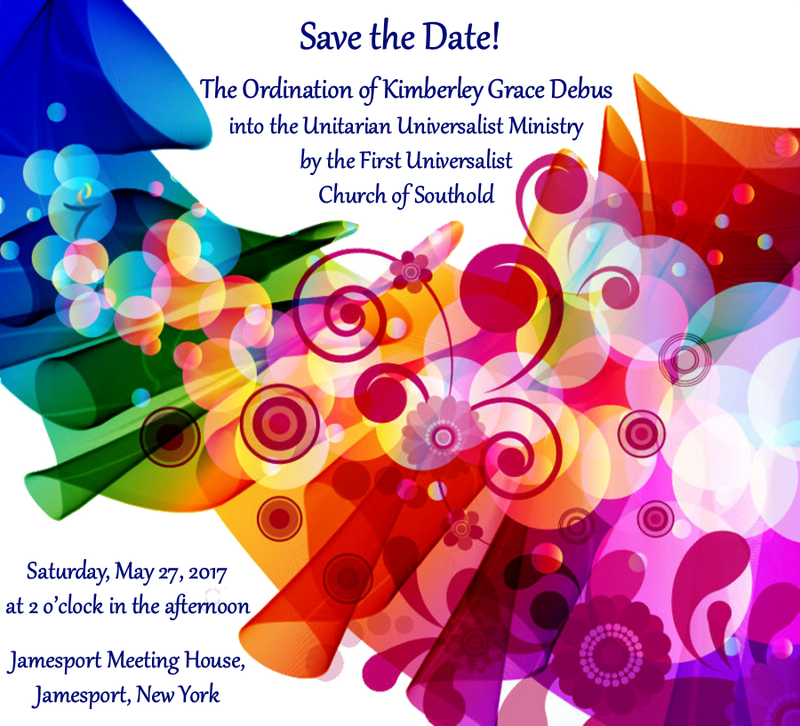 I am blessed that the Board of Trustees, on behalf of the First Universalist Church of Southold, has agreed to ordain me into Unitarian Universalist ministry. I realize of course that the ordination is not the start of my ministry. Rather, an ordination is in some ways like a wedding – just as a wedding is in many ways a spiritual and legal affirmation of the existing relationship, so too an ordination is a spiritual and legal affirmation of the existing ministry. And still, the act of ordination is a big moment – it will be a big service with some great music, great preaching and readings, and some pomp and circumstance. It will also be a party to celebrate the long road I have traveled, which you have traveled with me.